"Now we have a boat full of citizens right on top of our... stolen cargo. That's a fun mix." Zoe Washburne is an old military buddy of Mal's who fought against unification. The former Browncoat is one tough lady, with the experience to take command when necessary. Happily married to fellow Serentity crewmate Wash (ship's pilot), Zoe is sometimes torn between loyalty to Mal and her obligations as a wife. In the end, she manages to balance personal and professional challenges as the captain's Firefly sails into daunting new adventures. At one point during the series, Wash describes Zoe as "a warrior woman," and she really is. Formerly Corporal Zoe Alleyne, she was a member of the Dust Devils, a group of holdouts who kept up guerrilla attacks even after the war was over. She still wears body armor on most of her missions, and although Jayne is the crew's muscle, she could probably take him in a fight. 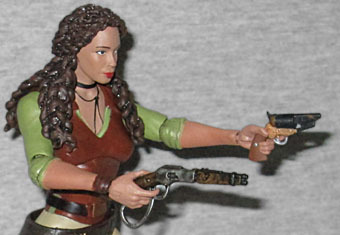 She was played by Gina Torres, which means between this figure and The Spirit, you can stage a little Suits reunion. The likeness on the figure is good from certain angles, but it's nowhere near as uncanny as Wash was. In fact, if not for the fact that this face is on this body and under this hair, you might not be able to guess who it was meant to be. Once again, Funko went back to the original promotional images to pick a costume for the figure. She's wearing dark boots, light pants, and a brown vest over a ¾-sleeve green shirt. Her belt is a molded part of the torso, and she has a free-floating holster around her waist. She's got a thick leather bracelet on her right wrist, and they even remembered to sculpt the leather string necklace she wears - according to the costume designer, that's the symbol of her marriage, but Zoe was seen wearing it in a flashback when she was still single. Whoops! The facial sculpt may be lacking, but the body isn't. Yes, the details on the clothes are nice, but what's really impressive is that they gave her body the correct proportions. She doesn't look like an exaggerated woman, she just looks like a woman - wide hips, narrow waist, etc. And she looks just as realistic when viewed from the side as from the front or back (something most toy manufacturers tend to forget). Plus, they did a great job on her hair. Really, it's just the face that could have used some more work, and it's entirely possible that was out of their control. Zoe moves at the neck, shoulders, elbows, wrists, torso, hips, thighs, knees and ankles. I carefully tested all the joints on my figure as soon as I got her, and nothing broke, though the swivel/hinges in the arms could easily be a problem on some samples. Funko needs to either thicken up the pegs on those joints, or stop using that clear plastic. Or maybe both. The figure comes with two weapons. First is her trademark rifle, the Winchester Model 1892 Mare's Leg. Popularized by Steve McQueen in Wanted: Dead or Alive, the specific prop used for Firefly had previously been used in Brisco County, Jr. - how cool! Her backup piece is the custom Colt 1860 Army she used in the pilot. The Mare's Leg can be holstered on her right leg, and both hands have their trigger fingers extended. Between their years in the service and the fact that he's a captain, Zoe is the only person who actually calls Mal "sir." And yet their friendship is entirely platonic, because Joss Whedon is not an idiot, and knows that isn't impossible. 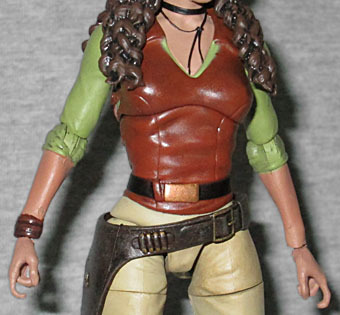 Zoe is a decent but not overly great action figure, as long as you get one with no broken joints.